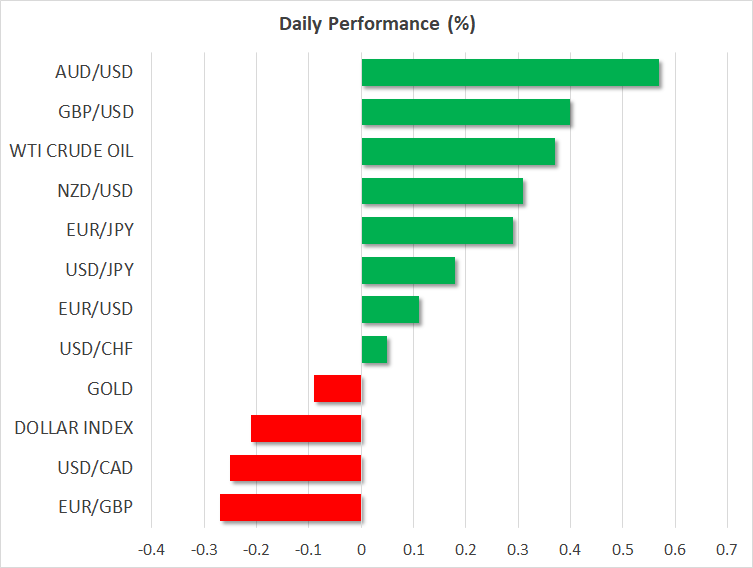 The greenback extended gains versus Japanese yen earlier on Friday, reaching a fresh three-week high around 111.80 before returning slighlty lower. All eyes will be on the US employment report for March at 1230 GMT. Predictions seem to be optimistic compared to the preceding month. Nonfarm payrolls (NFP) are expected to have risen by 180k from just 20k in the preceding month. Meanwhile, the unemployment rate is anticipated to remain steady at 3.8%, slightly above the 50-year low of 3.7%, achieved at the end of the previous year. Moreover, average hourly earnings are projected to have decelerated to 0.2% in monthly terms, however, year-over-year is forecasted to leave the rate unchanged to 3.4%. Those data are much awaited by investors as they will reconsider their outlook on the Fed’s monetary policy tightening plans. The Fed lowered its interest rate projections to zero for this year after it raise them four times in 2018. Also, policymakers mentioned that the economic activity has reduced in the last quarter of 2018, turning the recent view to a more pessimistic environment. The euro remained stuck slightly above the 1.1200 handle after the release of the minutes of the March 6-7 meeting and has failed to gain some ground since the absence of any positive economic indicators and more dovish comments coming from the central bank. European Central Bank (ECB) policymakers discussed on Thursday the risk that ultra-low interest rates pose to banks, as in the previous meeting they referred for a delayed interest rate hike plan until 2020. This delay suggest that rates will remain negative for longer and banks will continue to pay hefty fees to the ECB for placing their excess cash, creating a worry to policymakers as lenders transmit monetary policy to the real economy. Furthermore, the ECB announced that “Concerns were voiced that over time, the effects of persistently low rates could depress banks’ interest margins and profitability, with negative effects on banks intermediation and financial stability in the longer run”. Markets in the US were a sea of green, with the benchmark S&P 500 index adding 0.20% to its performance, hovering around the six-month high of 2885 and is also expected to open higher today according to futures as the negotiation in Washington between the US and China are still in progress. On Thursday, US President Donald Trump referred that the trade war between the world’s two biggest economies were getting close to a trade deal that could be published in the next four weeks. Despite that, Chinese President Xi is not participating at the negotiations, Vice Premier Liu He has transferred his view for an early conclusion to the discussions. Investors could also turn their attention on March’s employment report for Canada is forecasted to stay at 5.8% in March, the highest level since October, while the net change in employment is expected to show that the economy added only 1,000 jobs from an impressive 55,900 jobs in February. However, the participation rate is expected to drop to 65.7% versus 65.8% previously, while there could be some gains ahead for the loonie if wage growth and employment numbers show some improvement in the labour market. In the UK, any Brexit headlines may attract attention as well as markets will look out for any improvements in the negotiations between Prime Minister Theresa May and Labour leader Corbyn with only a week to Brexit day on 12 April. One precondition is for the UK to call for European elections during the next month.